After last week’s less than stellar offerings, movie fans will be delighted to see the wealth of new releases to choose from this week, including the Blu-ray debut of a certain whip-cracking archeologist, the latest from the mind of Joss Whedon and more. 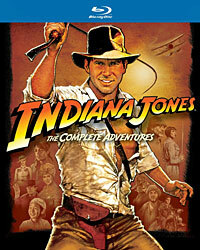 As one of the last great film series yet to be released on Blu-ray, Paramount’s five-disc box set finally puts an end to the wait with an awesome collection that features digitally remastered versions of the first three movies, as well as a copy of the red-headed stepchild of the franchise, “The Kingdom of the Crystal Skull,” which will at least be welcomed by completionists and George Lucas apologists alike. Enough has been written about the Indiana Jones films over the years that it would be silly to gush about them all over again – and if you’ve seen them yourself, then you already know how great they are – but there is something that warrants mentioning, and that’s just how incredible these movies look in high definition. “Raiders of the Lost Ark,” which received a frame-by-frame restoration in addition to the color-correcting process performed on “The Temple of Doom” and “The Last Crusade,” looks especially brilliant, with its 20-plus years miraculously erased to the point that it’s almost like a brand new film. Though it would have been nice if fans were given the option between the original trilogy and a set collecting all four movies (that’s how bad “Crystal Skull” is compared to the others), it’s hard to complain too much when the studio has done such an amazing job giving the series the tender loving care that it so richly deserves. Blu-ray Highlight: A lot of good bonus material has been brought over from previous releases, but the all-new making-of featurette “On Set with Raiders of the Lost Ark” is the undisputed gem of the set. Compiled from vintage footage of the production, the featurette offers an intimate look at filming certain scenes and the decision-making process behind those sequences. That footage is also supplemented by outtakes, deleted scenes and alternate takes, giving audiences a peek at what could have been. Leave it to Joss Whedon to take the horror genre and turn it on its head. The guy has been defying convention for years – from “Buffy the Vampire Slayer” to “Dr. Horrible’s Sing-A-Long Blog” – and if there was any genre in need of a shake-up, it’s horror. 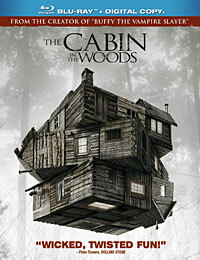 Directed by Drew Goddard and co-written with Whedon, “The Cabin in the Woods” is an entertaining and remarkably original genre hybrid film that, although it may appear to be a typical slasher flick at first sight, has more than a few tricks up its sleeves. Fueled by a great script inspired by horror classics like “Evil Dead” and boasting a wicked sense of humor, the movie is a fun twist on a tired formula. The cast of victims is also much better than your average slasher film, although it’s Richard Jenkins and Bradley Cooper as the pair of mission control guys pulling the strings that really steals the show. It does go a bit off the rails in the final act (though anyone familiar with Whedon’s work won’t be too surprised), but for a movie this ambitious, sometimes it takes that kind of risk to yield such a refreshing reward. Blu-ray Highlight: In addition to a really fun and informative audio commentary by Drew Goddard and Joss Whedon, there’s an excellent making-of featurette called “We Are Not Who We Are” that includes a look at shooting the climactic elevator sequence and a hilarious tour of the control room with actors Richard Jenkins and Bradley Whitford.